It's not named for a place, but conveys the notion of 'place' just the same. There's a lot, to say the least, that goes into bringing a new vehicle to market. And one of the pieces to that puzzle is settling on a name – which is just what Hyundai has announced today in the run-up to the 2019 New York Auto Show. That's where the Korean automaker will reveal the new 2020 Hyundai Venue. The new entry-level model is set to join the brand's expanding crossover lineup as its smallest member yet, targeted at a younger demographic of "urban entrepreneurs” (who evidently haven't made their millions just yet). Leaving aside the question of how a smaller vehicle could host events inside what's bound to be a small cabin space, the Venue nameplate conveys the notion of "place,” but in a different way from its soon-to-be stablemates. 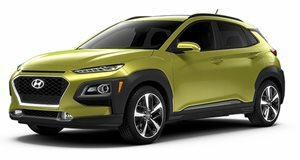 Hyundai has traditionally named its crossovers after geographical locations, often in the southwestern United States – like Tucson (in Arizona) and Santa Fe (New Mexico). The Santa Cruz pickup concept was named after a place in California, the Pallisade for a type mountain formation (for which so many places across America are also named), and the Kona after a place in Hawaii. Even the discontinued Veracruz (like the Terracan that came before it) was named after a state in Mexico, and the Creta compact crossover sold overseas for a Greek island. Unfortunately, the name is about all that Hyundai's telling us at the moment. But if the new Venue comes in smaller than the subcompact Kona, it'll be pretty small. Think along the lines of the Suzuki Jimny, and with potentially similarly rugged appearance, but designed for city streets instead of off-roading. One way or another, we'll find out on April 17 when Hyundai reveals the new crossover in Manhattan with "an innovative Augmented Reality” unveiling.